The 10th edition of ICC Cricket World Cup has started today on 17th February 2011. 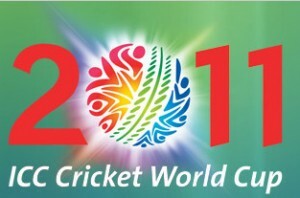 World cup cricket 2011 is being hosted by India, Sri Lanka and Bangladesh. This time there will be 14 teams, and they will play 49 cricket matches, including the finals. Teams participating in World cup cricket 2011 are Kenya, South Africa, Zimbabwe, Canada, West Indies, Bangladesh, India, Pakistan, Sri Lanka, Australia, New Zealand, England, Ireland and Netherlands. The official TV broadcaster of Cricket world cup 2011 in India is ESPN Star Sports and DD Sports. However, if you are a cricket fan and have a high speed internet connection, you may watch the world cup 2011 live streaming online through the internet broadcasting channel of ESPN Star Sports. 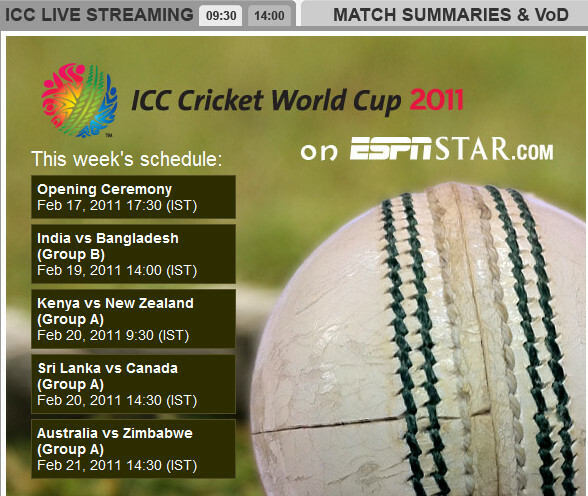 Official EPSNSTAR online streaming: You can watch all the cricketing action of the ICC world cup 2011 online at ESPNSTAR.com on match days. They also provide live scores, match replays and summaries. The service seems to be free at this point. WILLOW.TV:If you are living in US, the best way to watch World cup 2011 Cricket live streaming is by using the service provided by Willow.TV. Though it is a premium service they offer unmatched cricket streaming in HD quality, and they even have mobile applications that let you watch live matches in almost all smartphone platforms. Willow. TV maintains agreements with ICC and other cricketing agencies for online streaming of World cup cricket 2011. Therefore, the service is legal in all supported countries. You can purchase a suitable cricket package from their website, here. World cup 2011 live streaming in mobile: Vodafone in India has come to an agreement with ESPN, and that will allow them to stream world cup 2011 live on mobile phones. This service will be available for all Vodafone customers with a 2G or 3G smartphone and a valid GPRS plan. Contact the customer care for more details. ESPN Cricifo Mobile app: The popular Cricinfo Mobicast application has been redesigned to include several new features. Latest version will be known as ESPN Cricinfo and is already available for download at iOS app store. This app has features like push notifications, live cricket scores, ball-by-ball commentary, team ranking, news, video streaming, etc. Those who use other OS platforms can download it by going to ci.plusmo.com on their mobile browser. Between, what do you think? Who will win this world cup? Join the discussion below. Thanks! i would like to see the live match in office hours.working with fun & enjoyment. Thanks for providing the ESPN cricket link. Its working like a charm. i want to see cricket world cup 2011. please provide me……..
I’m in the UK and do not have access to sky sports. I would love to watch the matches live. Friends, read the article you can watch world cup 2011 online from ESPN Star Sport official website. good luck to you pakistan. i love to see live world cup . pakistan will get world cup. Nice collection of live cricket score app. If any one searching for best free live cricket score app. Live Cricket app is the best free live cricket score app. Must checkout link: goo.gl/NXZZ9 . @usman Pakistan will not see the second level. What acrap team you have there? You are full of match-fixers. i am in London. ESPNSTAR gives me a message saying the live stream is not available in my region. any idea about the link which can be used in London? Those who are not getting the live stream please Google for “espn go live cricket”. It might work at your region. Thanks!! ESPN is the option for watching the cricket match? good match going on between India and Bangladesh. this is the nice way to watch the live cricket, because so many people they can not watch on TV so this is the way to enjoy the cricket. THIS IS WHAT I CALL A GREAT INFORMATIVE POST THUMBS UP ….. I have found this link where you can see the worldcup, they are addding matches as they come. Want to watch d match badly. Pl make d arrangements…..
yes i think england is favourite in this tournament. I love Bangladesh cricket team and I hope they will win 2011 cricket world cup. Is it possible to watch World Cup Cricket in Europe, via any TV broadcasters or via Internet Streaming? The ESPN Star Sports tells me that the internet stream is not available in my area, and altough some websites mention that Eurosport 2 is a TV broadcaster of the World Cup Cricket in Europe I have not seen any cricket on Eurosport 2.
how to see live match on internet ? i am able to watch live cwc stream but i formate my computer and load winxp3 and now i am unable to watch live stream.Tell me reason please. I want to watch the matches. But I live in Canada. Here ESPN live streaming not available. Any help? i want to be a india vs pak. and pak. beat india cry. yr Google link is broken and i am unable to watch what i paid for on icc world cup us which i have been able to connect to for 2 weeks now. why is this broken?. I want to watch world cup online streaming thanks. Watch world cup cricket online, but how? Watch Live ICC world Cup 2011in HD. I just subscribe evercrichd.com it is worth of my money and time. excellent service provoder. Thx…… this is just cool….. espn bought the copyright! HI, i m in Dubai & want to watch the semi finals online. useful infor for all cricket lovers. i would like 2 watch world cup 2011 on computer because it will cost to much on tv $199 please please help! pakistan india match its not a match for an indian its a —— against (*** edited racism) who they r responsible for thousends of innocent muslim brothers in kashmir. india will win against pakistan ,mr aslam says pakistan will win …no dear never pakistan will not win cricket or anything under the sun if ur a pakistani iam sorry dear palistan is promoting terrror. I am not able to see live streaming in espnstar website can you help me some one else..
Can some1 giv me link 2 watch cricket worldcup live streaming ? I wish India will win & will get World Cup Trophy. I specially pray to ” ALLAH” for the success of Great Indian Cricket Team. May “ALLAH ” help them. Its good chance to see live TV like us when we have not tv channels. thnx dhoni ,,,u r d super hero ,,,,,,,,,,well done !!!! 2 servers will be available from 8th april 2011. Don’t miss the live cricket fun.